An unusual specimen of Discoteuthis was recently described (Salcedo-Vargas and Guerrero-Kommritz, 2000) that has a distinctive array of photophores. The squid was a mature male which raises the possibility that it could be the unknown mature male of Discoteuthis discus. Although the photophore arrangement is different than this species, some oegopsid squids show remarkable changes at sexual maturity. If this is not the case, then the species represents the third known species in the genus. with a diagonal groove in the funnel locking-apparatus. with a row of photophores on arms IV, some on the head and one at ventral mantle apex. Dactylus with suckers in four series. Medial suckers of manus with smooth inner rings. Figure. Oral view of the tentacular club of Discoteuthis sp. A. Drawing from Salcedo-Vargas and Guerrero-Kommritz (2000). Funnel locking-apparatus with diagonally positioned groove (similar to that of D. discus). Figure. Frontal view of the funnel locking-apparatus of Discoteuthis sp. A. Drawing from Salcedo-Vargas and Guerrero-Kommritz (2000). Free anterior margin of mantle smooth (i.e., flaps lacking). A series of 7 (possibly more) photophores embedded in aboral surface of each arm I. Three to 4 photophores embedded in skin of head around each eye (7 or 8 total). Large, round photophore (10 mm diam.) on ventral side of posterior tip of mantle. Figure. Ventral views of portions of Discoteuthis sp. A showing photophores (blue dots). Left - Mantle and fins. Right - Head and ventral arms. Drawings modified from Salcedo-Vargas and Guerrero-Kommritz (2000). This squid is most similar to D. discus. It differs in the size and arrangement of photophores, and club-sucker dentition. Additional features of the description can be found here. 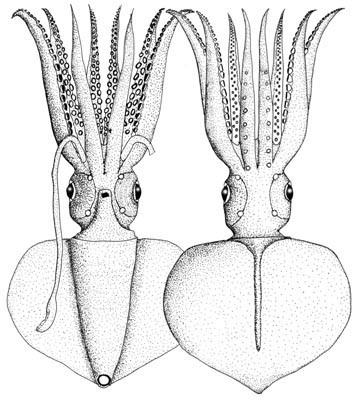 The single known squid was a mature male. The squid was captured at 43°00'S, 27°07'W in the South Atlantic. Salcedo-Vargas, M. A. and J. Guerrero-Kommritz. 2000. Three new cephalopods from the Atlantic Ocean. Mitt. Hamb. Zool. Mus. Inst., 97: 31-44. Three new cephalopods from the Atlantic Ocean. Mitt. Hamb. Zool. Mus. Inst., 97: 31-44. Page: Tree of Life Discoteuthis sp. A. Authored by Mario Alejandro Salcedo-Vargas and Richard E. Young. The TEXT of this page is licensed under the Creative Commons Attribution-NonCommercial License - Version 3.0. Note that images and other media featured on this page are each governed by their own license, and they may or may not be available for reuse. Click on an image or a media link to access the media data window, which provides the relevant licensing information. For the general terms and conditions of ToL material reuse and redistribution, please see the Tree of Life Copyright Policies.